Treasure Garden is a name brand for a line of umbrellas that range from market umbrellas to cantilevered umbrellas for both commercial use and patio furniture. 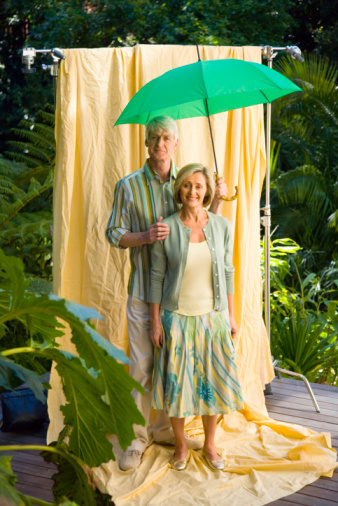 One of the most common Treasure Garden umbrellas is the wooden framed market umbrella. 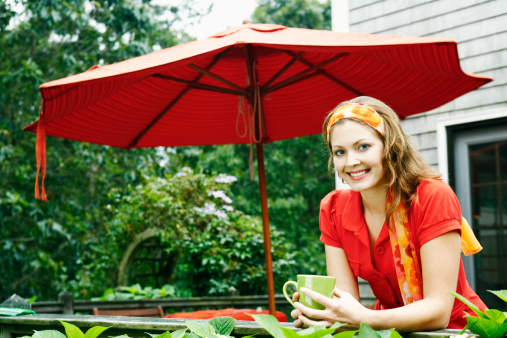 The wooden construction of these umbrellas makes them a durable, lasting option for your home patio. In addition, when these umbrellas break, they may be repaired rather than being thrown away. There are several companies that specialize in umbrella repair, or you can repair your market umbrella yourself. Remove the sun shade from your umbrella. Take apart all seams with a seam ripper. Lay the parts of your umbrella awning flat side-by-side. Measure the total area that they take up. This is the total size of replacement fabric that you must purchase to construct a new awning. Pin the old parts of your awning to the new fabric and cut the fabric out. Stitch the new awning pieces together using an overlock sewing machine. Put the new awning in place over the frame of the umbrella. Assess the damage to the frame of your umbrella. One of the most common problems with an umbrella is that the cord that lifts the umbrella has broken. Re-string the umbrella by detaching the umbrella at the pivot point. Do this by taking the pin out of the pivot point. Tie the cord to the ring that lifts the umbrella ribs at the top, and then thread the cord through the pulley at the top of the umbrella. Open the crank housing by sliding the rings away at the top and bottom of the housing or removing the screws that hold the housing together. Fish the end of the new cord through the hole in the umbrella pole that is inside of the housing. Wind the cord around the pulleys at the bottom of the housing. Crank the pulleys in the housing using the pulley handle to take up slack. Then close the housing. Determine which part of your frame is cracked or broken, and order that part from a parts supply store. The most common parts in need of replacement are umbrella ribs and the umbrella pole. Disassemble your umbrella frame only enough to free the broken part using a set of small wrenches. Discard the old part. Put the new part in place of the old part in the umbrella frame. Reassemble your market umbrella frame.